He has just finished the works for a new exhibition. This time he depicts the old walls, the street corners and narrow alleys of Zanzibar’s Stone Town. He is giving us an impression of the past days, and every brushstroke intends to teach us more about where we came from. 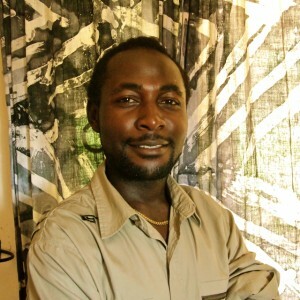 The artist himself was dragged out of his Owino secondhand clothes shop, to be taught by twelve artists at the Ngoma studio in the early 2000’s. Today, he is a commercial success, but he will never forget his roots. With time, he plans to invest in his own studio and nurture a future generation of visual artists. 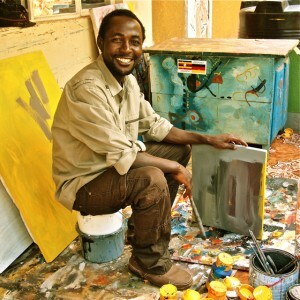 Editor Thomas Bjørnskau talks to Edison Mugalu about his journey to become one of Uganda’s best-selling visual artists. Editor: How did it all begin? ”Growing up, I remember Arts being my best subject in school. I used to skip chemistry lessons, sneak out and lock myself in the art room. I grew up in a village in Kayunga. My parents couldn’t afford paint, so what I did was dealing with nature. I used to look for green, red and yellow flowers. I painted with watercolours, used ink mixed with squeezed flowers. Ed: Why did you enjoy making art so much these early years? ”Maybe because I was always appreciated. People liked what I did. When I returned to the village during the school holidays, I used to make bigger portraits of passport-sized photos for people in the village. They used to love these images, and pay me for the job. Ed: But you didn’t go to University to study and to develop your most significant talent. Why was that? ”After completing High School, my parents ran out of money. I decided to do other business and started selling secondhand jeans and trousers at the Owino market. Jjuuko Hoods, who had gone to the same school as me, used to come to the market and buy canvases. He knew my talents for arts, introduced me to his studio – Ngoma Studio – and invited me to come and paint whenever I had time. So, Sundays and Mondays were days off, I was free to paint those days, every week. Ngoma offered me free space, there were twelve artists under the same roof. They introduced non-stop workshops, sometimes with international artists. There were artists with degrees. They showed my which books to read. They shared different techniques, the same techniques they learned at University. Ed: But did you feel that this was going to be a living? ”Now, Jjuuko also showed me how the art market works, he took me to Nommo Gallery, to Tulifanya Gallery. And for the first time I saw these price tags. Paintings priced one or two million Ugandan shillings. With red stickers. Which I was told meant that the piece was sold. And here I was striving for 400.000 in a month at Owino. I remember feeling ’I was born with the money inside me, I just have to bring it out’. So I started paint 24 hours a day at Ngoma, and Jjuuko used to laugh at me for my eagerness. Ed: I guess; at times like that it is easy to give up. What did you tell yourself to keep moving? Ed: Were you ready to give up at any point? ”At that time, I didn’t have a kid or a wife. I was totally free. And I had to lie to my parents, saying that my business in Owino had gone bad, so I had to sell my cattles. And I had really nowhere else to go. I had quit Owino, and worked 24 hours days at Ngoma. My focus was to go through it. Never return and never look back. I had always been a survivor and knew that I had to be strong. And also, I could see progress in my work. So, in 2003, I took two artworks to Nommo Gallery. A guy called Raymond had organised a two-day workshop with the intention to exhibit the final paintings. I painted one piece each day, they were stick figures. Before this, I had probably painted a hundred paintings, most of them were just bad, painted on mount boards, or offcuts from Tulifanya. But these two artworks were different … I didn’t rush at all. Later, I was told by a friend that my art piece was the first to be sold in the exhibition. I was so surprised. And excited. I thought I was going to be in my situation – neither exhibiting nor selling – for two whole years. Now, I had got some two hundred thousand shillings, so I could leave the paper stage and cheap paint. I went and bought canvas and acrylics, put aside 70.000 to live on. Then I went back, painted 25 art pieces and took them to exhibitions in Afriart and Tulifanya. Ed: It seems to me that you have a strong business mindset…? But at one point in Edison’s career, all these finished artworks from his rehearsel period became assets generating revenue. In 2005 he was introduced to Aidchild, a charity organisation selling to the tourists stopping at the Equator gallery. He selected from his 100+ storage and turned painted mountboards into money. He got monthly cheques with seven digits and an award for being the most money-generating artist. Ed: Having had this commercial success; how confident are you that you are able to develop yourself as an artist and sell your paintings in the future? In the beginning of April, Edison’s most recent artworks will be exhibiting at the Afriart Gallery. Ed: What do you think are the new features in this coming exhibtion? Ed: But a lot of your previous work has been like that …? Ed: And the subject matter? Ed: And why is bringing the past to the present such an important message, do you think? 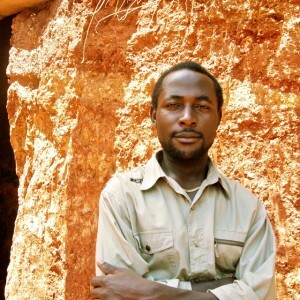 Edison Mugalu outside his home wall. Ed: Working on this current show, was it easy for you? ”There is no artwork that is easy. Every piece is a challenge. The most difficult thing is that you try to drive it, but it drives you. It is a struggle. You want it to move it in one direction, but it goes its own ways. That is why artists sometimes keep adding layers after layers. Each artwork is a struggle, and you leave the canvas sweating. Ed: How do you normally start working? ”First, the natural surroundings must be right. Not too hot. Not too bright lights. Too bright lights might kill my artistic eyes … you know, artists have four eyes, two inside which envision something before you paint it. Then, I have to be relaxed. I can’t move from the city centre to where I live and work in Kireka and jump directly at it. First, I have to sleep a little, drink lots of water, listen to some cool music, build up the mood. Ed: What happens when you are in the right mood? ”I have always loved water. When I was little and we used to fetch water in jerry cans, I could sit in the water area for a long time. Just looking at the water and how it reflected the sky and the green surroundings. Ed: Is there a message in your art, related to the green movement? 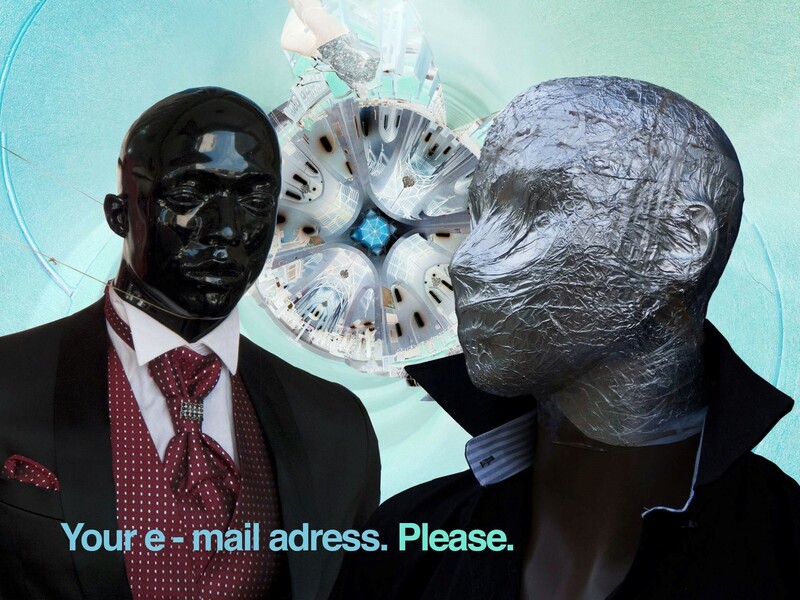 Much like his consciousness around this cyclus of nature, Mugalu thinks in cyclic terms around his business. He would like to use his recently accumulated wealth to invest in the future generation. 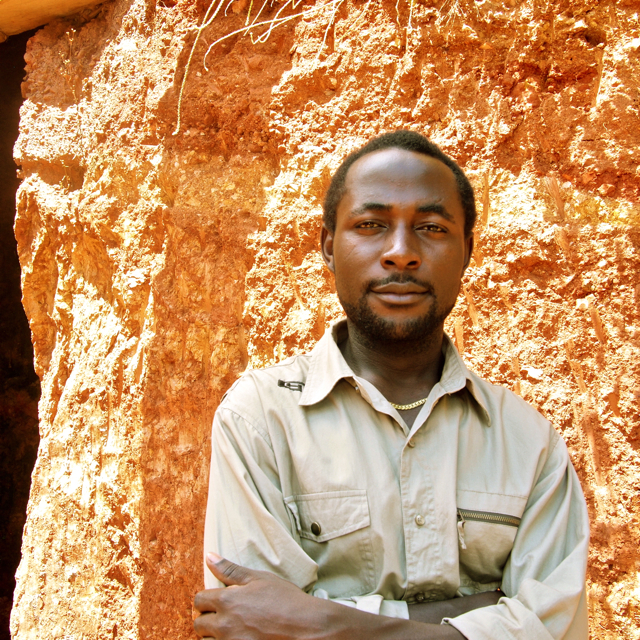 He now pursues his dream of making a studio in his home village in Kayunga. 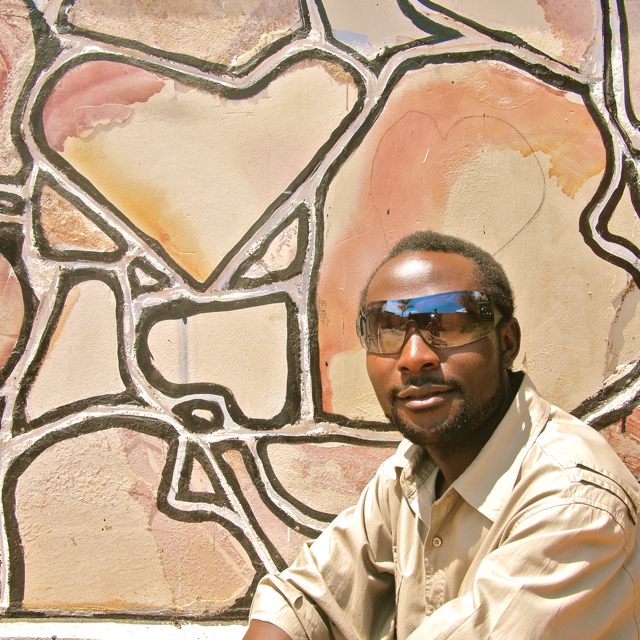 ”Many people want to study art from me, as I studied it through Ngoma. I need some space and I am thinking about investing in real estate. When you are building a house, that space can be turned into a class for other people to create art. And people can fly on their wings after studied arts. Sometimes they don’t know that this market exists, like I didn’t know when I worked in Owino. It was just by chance I started with a friend who helped me see the market. So if by chance I would also help people who are serious. i definately think eddy has come along way,i saw his works at the laba street art festival at mackinon road this month.i fell in love with it n he is my source of inspiration.i am looking forward to seeing him.good job eddison mugalu.